Pat B. Testimonial - Lethbridge, AB. I have to share the experience I had with Geoff Storozuk, Suzuki Automotive Specialist. 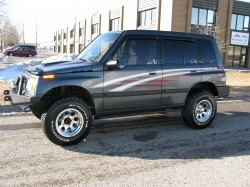 My original request was to have Geoff find me a four door Suzuki Sidekick. He stated he had a 1993 Sidekick available and he would be more than willing to build it for me. First of all, I have to say I’m very particular about the appearance and maintenance of my vehicles, so, when he showed me this decrepit piece of metal in a snow bank I was more than sceptical about the outcome. All he said was “you’ll like it when I’m finished”. I decided to go with this project because all I heard was positive raves about his work. When I next saw the Sidekick it was a vehicle frame on his workshop floor. A complete re-build was started. Later he phoned to say the Sidekick was ready, I was in total awe after I saw the quality of his work and craftsmanship. A 4” Lift, 30” tires, customize front & rear bumpers, trail wedge side bars, and incredible detailing. The engine (a complete rebuild), transfer case, front and rear end, transmission all re-built. Needless to say I was more than satisfied with the final outcome. I later had the Sidekick appraised and was completely overwhelmed when the appraiser valued it at Thirty thousand dollars! The satisfaction I’ve had from owning this Suzuki is unbelievable. 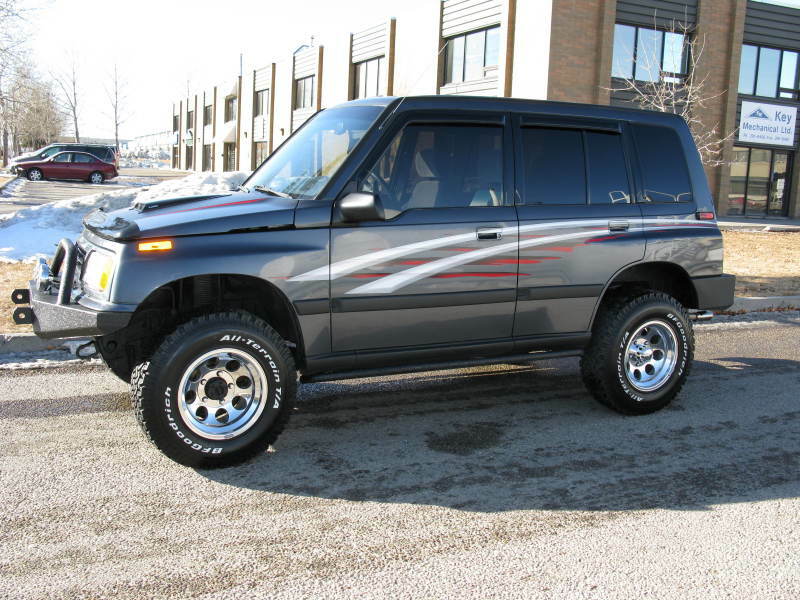 Driving around the city this Suzuki Sidekick is a real eye catcher, it’s a fantastic looking vehicle, a great tow vehicle for the motorhome and you will not find a better vehicle for the back forty or fishing trip. I don’t usually recommend people or businesses; however, when I do require another four wheel drive, Zuki Nation will be my first stop.